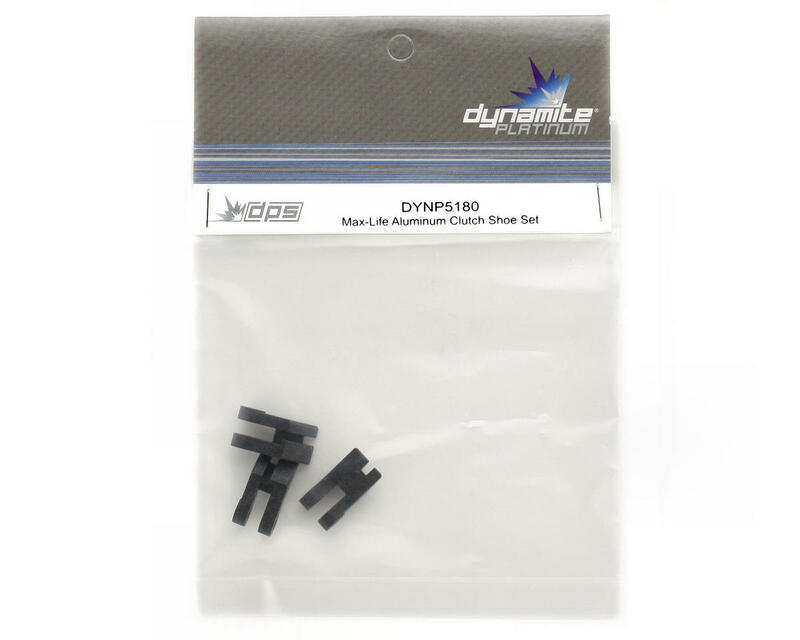 This is a set of three Platnum Series Max Life aluminum clutch shoes from Dynamite. Designed to pull more performace out of your clutch and made from revolutionaly new alloy materials. These cluth shoes slows the wear rate without sacrificing performace. They produce less heat buildup on clutch bell and bearings, and last up to 3x longer than all other clutch shoes. Note: No springs are included with this set. These are awesome and last easily 4 times longer then stock Mugen shoes and grab the same, plus do not eat up your inside of the clutchbell. Highly recomended these to others. 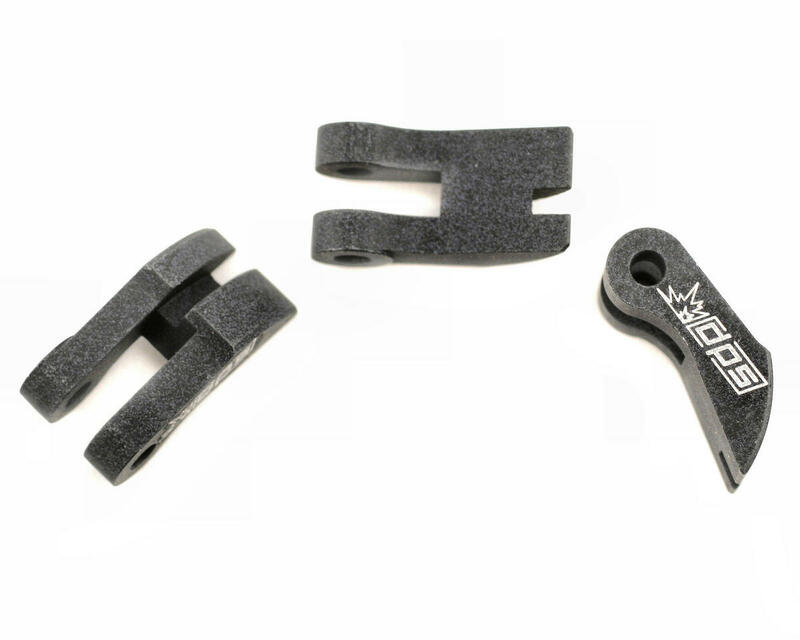 I race a lot with my Mugen MBX6 and MBX6T and these save pit time, as I don't have to change out my clutch shoes every race weekend, thanks!! for 17 dollars the best clutch shoes. They realy last much longer than any other alu shoes. I am running those on my xt8, and grp 28 engine. No problems at all, very pleased. Very durable!! Great performance!!! They last for hours of play!!! i have a kyosho GT2 with a 34 mm flywheel and evolva VS058 clutchbell. dynamite clutch shoes,and on a kyosho gt2? Running these on my D8T Truggy! Great setup for a clutch especially on truggy where you need that extra punch! Will keep you posted regarding wear n tear! Run this shoes on my Jammin' X2 buggy and Truggy. That is awesome! Very tough!!! I get 3 sets and very happy about this! Run with Ofna spring 1.0 or 1.1. It's a must to have!!! Will these fit in a losi eight 2.0 4 shoe clutch set up? or can you run just a 3 shoe in the stock flywheel? do your self a favor and pick up 2 sets. Hi guy's, will these fit the stock Mugen MBX6 flywheel and clutch bell ? I heard that these are great, but what brand of bell and clutch nut and flywheel would work with these? I have a GRP Modded 28 engine on my Kyosho Inferno GT and these are the only shoes that last. I have tried most others and all have broken, melted, worn out prematurely etc....these are by far the best!!! I have ran a gallon with these chulch shoes and thay still look good and work great. get these and you wont be disappointed. Just got done running my buggy with these all day. The track was pretty muddy so add another couple of pounds of mud to it. After a total tear down of the car the clutch shoes still look great! Still have miminal wear. My truggy on the other hand pretty much melted the stock aluminum X-ray shoes that came with it. Needless to say, it got a new set of these clutch shoes tonight. I highly recommend these. Thanks -//- Ran about a gallon on these and was afraid to see what they were going to look like.....They looked like new when I took the clutch bell off. They hook up great too. I highly recommend these to anyone. You can't beat the price either. These are the best clutch shoes out PERIOD!! These things are sticky and have outstanding wear!